The industry may be in turmoil, but prizes must be awarded, want must be sparked, and the cycle of enthusiasm begins anew. Whether there’s still enough of an industry to actually license, translate and publish any of these comics remains to be seen, but hey, I’m sure you’ll be able to download pirated versions via some fabulous app. Anime News Network has the details on the 39th Japan Cartoonists Awards offered by the Japan Cartoonist Association. ANN also has the rundown on the 34th Kodansha Manga Awards. One of the winners, Kuragehime, was a finalist for the latest Manga Taisho Award, and there seems to be a healthy amount of interest in it, at least based on my unscientific poll. Asahi Shimbun covers the 14th Osamu Tezuka Cultural Prize winners. 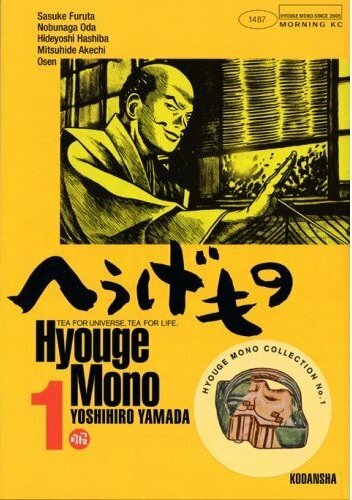 Top honors went to Hyouge Mono, written and illustrated by Yoshihiro Yamada. Ed Chavez wrote an appreciation of Yamada’s work for Otaku USA. This year’s Manga Taisho winner, Mari Yamazaki’s awesome-sounding Thermae Romae, won the short story prize. You are currently browsing the The Manga Curmudgeon blog archives for the day Thursday, May 13th, 2010.